If you are looking for some security props to keep an eye on your home or business from anywhere then the compact, stand-alone wireless security cameras are the ones for you. They are easy to set up and operate. They live stream video footages directly to your smartphones, tablets or a PC along with instant notifications in case of any disturbances in the live feed. Most of these wireless cameras for home use or business are equipped with features like the night vision and the automatic motion-detector recording. The wireless digital surveillance camera is a simple and smart way to keep surveillance on your property. It offers an assurance by enabling you to keep note of things going at your home or business while you are away from the live feeds. It helps to know that the video is just a button tap away. Infrared to detect motion at night. Sensors for the windows and doors. In case an intruder is out of camera’s focus, you will still get alerted to their presence. Facial recognition to identify a stranger. Good video quality preferably with HD resolution. The better streaming quality and reliable alerts would be more helpful. Equipped with two-way communication which can be very useful to keep an eye on kids, babysitters, house sitters or pet sitters. 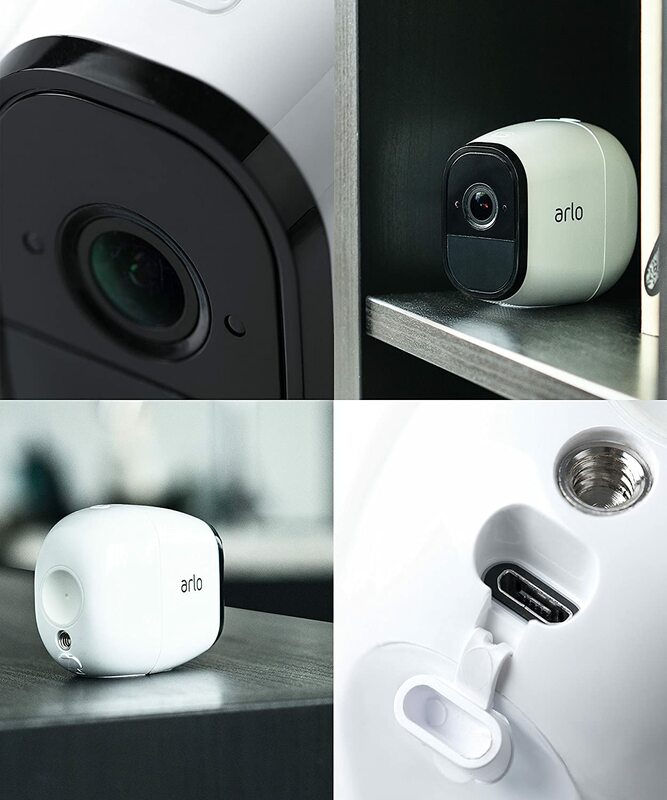 Arlo Q is a white diamond shaped camera, except for its black lens and the bevel. The 3 x 3 x 1.5-inch camera pivots rotate freely on the ball head. An over-all best webcam-based security cameras. It has much higher video resolution and uses the best software. It doesn’t require a base station. As it does not need batteries to run, it can work continuously without trouble. Check more about this product here in an earlier post. The motion and sound detection systems used in this camera are also top of the line in comparison to other cameras. The installation process is easy and trouble-free. The Belkin is about the size of an iPhone 4 with a compact design. It offers motion-activated recording. You can save the recorded footages online. It is much easy to set up. It can control WeMo home accessories. The video quality could do better but still a good wireless security camera with a good combination of useful features at a great value. This made it to the list as it is really affordable and for the price,you really get a lot for your money. A camera with a sleek design and a smooth, cool-gray metal stand that supports a black camera eye. The camera is supported by the magnetic base. It has a single LED on top of the lens that stays green when it is connected and recording. It’s an excellent upgrade that delivers even higher quality 1080p video which is hard to beat, an impressive night vision, and better sound and motion alerts. This is the best smart home integration security camera to buy. Can be programmed with Nest Protect and Nest Thermostat. An attractive security camera with an ovoid-shaped, smooth and curved body, this camera is a top-notch indoor as well as outdoor wireless security webcam. It is weatherproof and waterproof. The high-quality video capture is second to none. The desktop and the mobile apps for Arlo Pro are powerful and easy to navigate. Along with versatility, they offer a good set of useful features. It is powered by a 2440-mAh battery which is rechargeable and it lasts for six months on one charge. Sitting on a well-designed magnetic dock, this is more a lifestyle camera than a security camera. It runs on a rechargeable battery. The battery life is of two hours. It streams good quality 1080p live video recording 24/7 and sends instant alerts on the phone when it detects a motion. The features include smart filtering, two-way communication, a time-lapse function, and night vision. Canary keeps your mind at ease with its 147-degree lens view that features a high definition 1080p video recording. This camera is also useful while you are at home as it can sense the air quality, the temperature, and the humidity. It helps create a pleasant as well as a healthy atmosphere to live in. With over 4000 reviews you can be sure this product is loved by many. There are different online and offline shops selling home security cameras, you should do your homework and find what works best for you, in a previous post, we gave tips on buying security cameras for your home. If you`re purchasing online, then Amazon is the favourite place to shop, check this post that explains why Amazon is the best place to shop online. 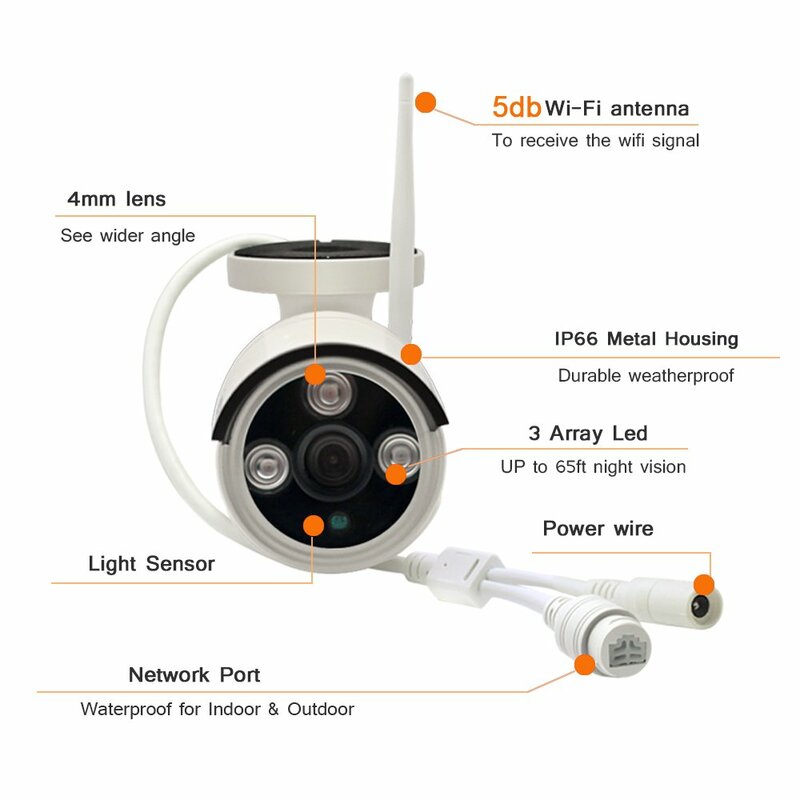 If the camera is for security purposes then a Wi-Fi security camera which comes with an alarm, night vision, instant and reliable notifications would be the best-suited one for the job. In case, you intend to use the camera for outdoors then it would be prudent to inform the passer-by that they are on camera. You can place a small notice board alerting them of the same. If it is for indoors then there is no need. If you plan to buy a security camera just for lifestyle purposes then an alarm probably isn’t necessary but a camera with a two-way audio and unobtrusive design definitely will be. In the end, out of all the wireless security cameras mentioned above, the Netgear Arlo seems to be the best WiFi security camera yet. The important deciding factor is the complete wireless connectivity with a solid 6-month battery life. Moreover, the video quality is impressive and it is waterproof so it can be used both outside as well as inside. If you have any questions, please leave a message below and will sure get back to you.If you know anyone who can benefit from this post, go ahead and share with them in your favourite social media. Great details on the wireless security cameras! 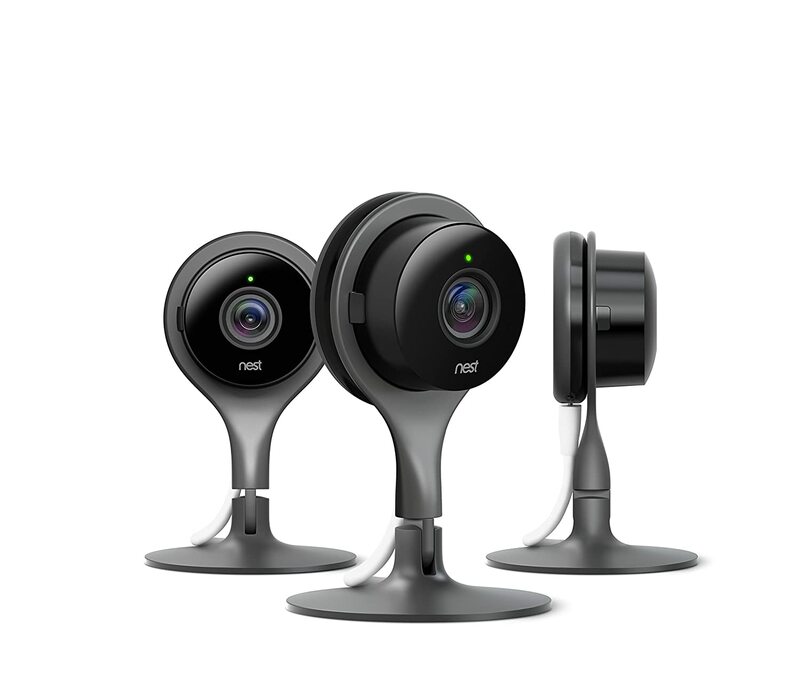 I looked at the units in your article and I think I like the Nest Cam the best. I have already looked at this on Amazon, but now that you have compared it to so many others, I like it even more. Do you use a particular brand for your own cameras? Thanks for stopping by Dave, I use Samsing but this is because it was affordable for me at the time of purchase plus, I purchased offline and local shops do not have a large selection of security cameras. I think the most important point to consider first is if the camera is going indoors or outdoors before you decide on a brand and move from there. Great info here. I love the Arlo Pro. The Ring series of cameras are great too. When they only had the doorbell, I wasn’t a fan because I wanted more cameras than that, but now they have the full line with additional camera and even the flood light camera. The app is super simple to use and the community feature is great. thanks for stopping by. Home security cameras today can not be compared to the older ones.I remember in the past when the door bell rang and we had to walk down to check who`s there. You`re right, security cameras today are so superior and offer so much,Ok, some still say they are expensive but, there are indoor security cameras which cost less than$50. These wireless security cameras are simply awesome, we have 3 robberies in our area in the past month and I feel my house will be targeted next, what can I do to stop them? I think I will be getting a guard dog also. I also need some cameras, I particularly like the logi circle option, what are the best priced options for just a basic starter package? Security cameras can be bought for as cheap as $50, having said that, you do not want the cheapest version,you should invest in a home security camera that will give you the best images possible should there be intruders or vandals. This article is such a wealth of information on the various factors to consider when purchasing a wireless security camera. I was feeling lost as this is not something I’ve ever considered before. But, with a recent rash of break-ins in my neighborhood, several friends, and family members have encouraged me to check them out. Based on your recommendation, I’m leaning toward the Arlo Pro. Thanks for your help as I figure out my options! Glad my post helped you understand more about home security cameras.Breakins and vandalism is not only in your place but everywhere, kids bored with nothing to do go out to vandalize neighbours properties “just because” robbers and thieves out there looking for unsecured property. Unfortunately we can not always be around to control our properties, but we can have hidden eyes helping us catch the bad guys.